Planktonic microfeed. 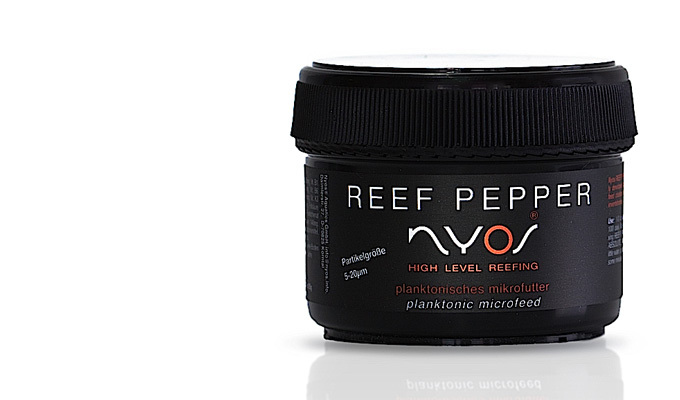 Nyos REEF PEPPER is a highly developed plankton microfeed clusters for corals, invertebrates, and marine ornamental fish (particle size: 5-20 mü). We recommend mixing with salt water and adding a few drops of Nyos ABSOLUTE AMINOS in a separate container for the perfect activation. 1-3 dosage spoons per 100l daily. We recommend mixing REEF PEPPER with Nyos ABSOLUTE AMINOS, plus a little water, and allow to soak for some minutes.